R2 employees are smart – not bragging,’ just sayin’ -- and we only hire smart people. R2 employees are smart, resourceful and risk takers, who are empowered to think differently. As a result, we deliver astonishing results. We make our work look easy; we don’t get in our own way. Our focus is on effectiveness and efficiency in making valuable contributions and progress on what matters to the business. When an innovative drive and passion meet collaboration, the result is awe-inspiring. I am sure you have heard the adage “you are what you eat.” At R2, we are whom we hire, and we hire great people, with the skills that always deliver turf-breaking ideas. For the R2 team, 1+1 ≠ 2, and never will. We always expect the unexpected. Mutual respect is the law at R2. R2 was founded by a committed team that values hard work, dedication and professionalism. We value the contributions and opinions of everyone regardless of title. When we have a difference of opinion -- believe me there will be times we do -- we constructively work through it to find the best solution. Pardon the cliche but this synergy always produces a whole that is greater than the sum of its parts. Blended workforce – makes a strong pot of coffee! Diversity fosters innovation and provides insightful views that are powerful to our team, our culture and our success. We value each other, our differences and we want to hire others who value it to. Psychologists have demonstrated that heartfelt laughter breeds creativity. 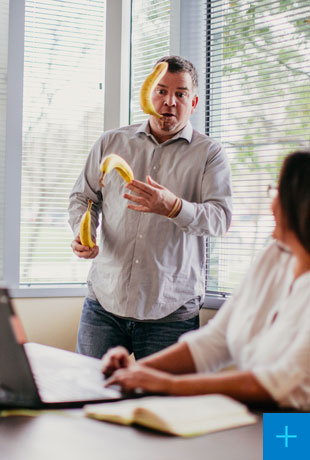 So, it is not surprising that you'll find plenty of laughter in our meetings, from our offices and in the hallways of R2. Let’s face it, without our families and our support system could we really be the people we are? R2 sincerely appreciates the support from our families and every now and then we get together to enjoy each other’s company and those who encourage us to be us!